The Axicon 15000 has been designed to read both two-dimensional and linear barcodes up to a maximum size of 52 mm x 31 mm. The system uses a special array of LEDs and a CCD-based sensor to capture each barcode image before it is analysed. It is able to verify multiple barcodes in the same field of view, whether they are 2D or linear codes, and the user sees the results for each barcode by selecting the relevant barcode on the screen. QR Code, GS1 QR Code, Data Matrix and GS1 DataMatrix symbols can all be verified, as can any EAN/UPC, ITF-14, GS1-128, Code 128, or Code 39 symbol with a maximum width of 52 mm. ISO/IEC-compliant verification of both linear and 2D barcodes. Each linear symbol is analysed automatically using ten scans through the barcode height, as specified by ISO/IEC 15426-1. Each barcode can be verified at any orientation so using the Axicon 15000 requires no special expertise. 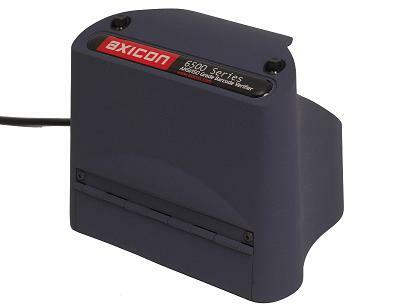 The Axicon 6015 barcode verifier is designed to verify small linear barcodes (with a maximum length, including quiet zones, of 66 mm) typically used on products scanned at the retail point-of-sale, or pharmaceutical products scanned at the point-of-care. These barcodes include EAN-13, EAN-8, UPC-A, UPC-E, Code 39, Code 128, HIBC, GS1 DataBar, GS1-128, CIP 39 and Laetus Pharmacode*. Laetus Pharmacode verification requires dedicated additional software. A CCD imager-based linear barcode verifier, designed to be ISO/IEC compliant. Aperture automatically switchable between aperture reference numbers 03, 05, 06, 10 and 20. Scan width 66mm (including quiet zones). Wavelength of light 660 nm. Weight: 230g. Size: 165 x 75 x 55 mm. The verifier is supplied as the verifier read-head, its data cable, a CD with the Axicon verifier software (in several languages), a quick start guide, a calibration card and compliance certificates in a protective carry case. Applications: The Axicon 6500 Series is aimed at verifying small to medium size linear barcodes, (max 125 mm), used in general distribution of retail products (EAN-13, EAN-8, UPC-A and UPC-E, GS1 Databar, GS1-128, ITF-14 (max 80% magnification). This easy to operate, plug and play system is perfect for product manufacturers, label printers, printers and packagers (cardboard, flexible, aluminium, etc), pre press studios. Thanks to its ideal combination of optical apertures and capture size, this verifier is the only one that can cater for all types of barcodes at most sizes. Large logistics barcodes such as ITF-14 barcodes at 100% magnification cannot be verified though. The verification system is delivered complete with: the read head (hardware), a CD with the Axicon verifier software (in several languages), a data cable, a quick start guide, a calibration card, compliance certificates, all in a protective carry case. The Axicon 6515 barcode verifier is designed to verify linear barcodes with a maximum width, including quiet zones, of 125 mm. This means it can be used to check all GS1 symbols used at the retail point-of-sale (EAN-13, EAN-8, UPC-A and UPC-E, GS1 Databar), those used on outer cases (EAN-13, ITF-14, and GS1-128), and on logistics labels (GS1-128). For anyone printing barcode labels using a 100 mm (4 inch) wide printhead, this verifier is perfect. A CCD imager-based linear barcode verifier, designed to be ISO/IEC compliant. Aperture automatically switchable between aperture reference numbers 05, 06, 10 and 20. Scan width 125mm (including quiet zones). Wavelength of light 660 nm. Weight: 180g. Size: 145 x 113 x 128 mm. Designed to function with a PC running any currently supported version of Microsoft Windows, or the Axicon PV-1000 portable display unit. 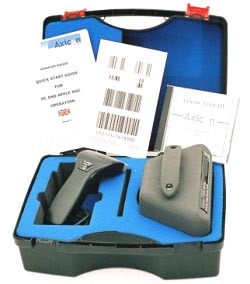 The verifier is supplied as the verifier read- head, its data cable, a CD with the Axicon verifier software (in several languages), a quick start guide, a calibration card and compliance certificates in a protective carry case. 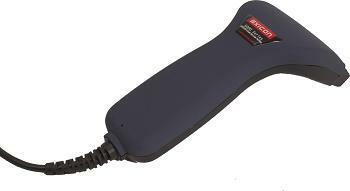 The Axicon 6525-S barcode verifier is designed to verify linear barcodes with a maximum width, including quiet zones, of 125 mm. This means it can be used to check all GS1 symbols used at the retail point-of-sale (EAN-13, EAN-8, UPC-A and UPC-E, GS1 Databar), those used on outer cases (EAN-13, ITF-14, and GS1-128), and on logistics labels (GS1-128). For anyone printing barcode labels using a 100 mm (4 inch) wide printhead, this verifier is perfect. It can also be used to check Code 39, Code 128, HIBC, CIP, PZN and other codes. Designed to function with a PC running any currently supported version of Microsoft Windows. It does not work with the Axicon PV-1000 portable display unit. Applications: The Axicon 7000 Series is aimed at verifying large size linear barcodes, (up to 195 mm), used in general distribution of retail products (mainly EAN-128 aka GS1-128, ITF-14, pallet labels) . This easy to operate, plug and play system is perfect for product manufacturers, thermal transfer label printing operations, printers and packagers (corrugated cardboard). The Axicon 7015 barcode verifier is designed to verify large linear barcodes with a maximum width (including quiet zones) of 195 mm. This means it can be used to check all barcodes used in general distribution, whether they appear on outer cases or on pallet labels (EAN-13, UPC-A, ITF-14 and GS1-128). For anyone printing 100% sized ITF-14 symbols, or A5 or larger pallet labels, this verifier is perfect. ISO/IEC verification with ANSI option, traditional verification, symbology auto-discrimination, automatic variable aperture, scan saving and loading, static reflectance meter, display of x-dimension and magnification, individual bar and space dimensional analysis. Product look-up option and other software plugins are also available. A CCD imager-based linear barcode verifier, designed to be ISO/IEC compliant. Aperture automatically switchable between aperture reference numbers 08, 10 and 20. Scan width 195 mm (including quiet zones). Wavelength of light 660 nm. Weight: 1kg. Size: 215 x 120 x 125 mm. PC running any currently supported version of Microsoft Windows, or the Axicon PV-1000 portable display unit. The Axicon 7025-S barcode verifier is designed to verify large linear barcodes with a maximum width (including quiet zones) of 195 mm. This means it can be used to check all barcodes used in general distribution, whether they appear on outer cases or on pallet labels (EAN-13, UPC-A, ITF-14 and GS1-128). For anyone printing 100% sized ITF-14 symbols, or A5 or larger pallet labels, this verifier is perfect. 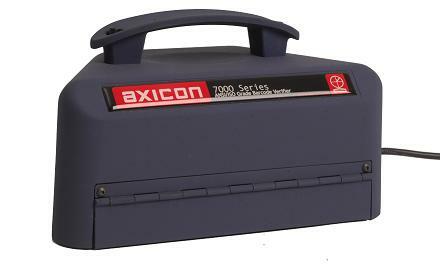 Presentation: The Axicon ISO/ANSI High Speed verifier comes in two versions the Axicon 6500 HS and the Axicon 7000 HS. It is aimed at performing online verification when integrated in to thermal transfer or ink jet label printers. It is able to operate at label substrate speeds of up to 12.5 cm per second and verify and validate symbols at a rate of up to 2 labels per second. The labels can either be returned to the internal rewinder or reloaded to an external rewinder. System requirements: PC with USB2 interface running Windows 2000 or XP. The verification system is delivered complete with: the read head (hardware), a CD with the Axicon verifier software suite( online software in english only), a data cable, a quick start guide, a calibration card, compliance certificates, all in a protective carry case.